Suvorna is a company which is based in US and which manufactures beauty tools for haircare, nail care and skincare, as well as leather accessories such as wallets, handbags, offering them in special series. 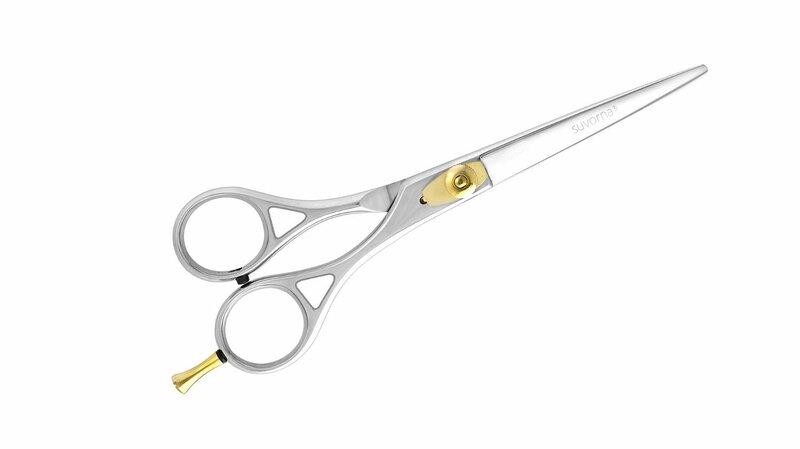 These Suvorna haircut shears from Razeco e95 series are hand crafted with highest quality Japanese J2 420 stainless steel, creating professional instrument for hairdressing professionals. These shears are specially designed for smooth cut, without causing any distress to barbers fingers and hands, thereby providing perfect haircut and constant comfort all day long which is very important for professional hair masters. These Suvorna barber scissors are 6 inches long, but their razor edge convex hollow ground blades are 2.5 inches long for longer duration. This product has gold plated knurled knob and backing plate which provide tension adjustment, so every hairdresser can adjust these shears for their individual needs. They also have removable gold plated finger rest for superior comfort and ergonomics, as well as detachable rubber finger inserts. Without these rubber inserts finger holes are 0.8 inches wide, therefore, with these inserts you can adjust the appropriate size for yourself. It should be mentioned, that they come with synthetic leather pouch, so they are safe to move. These Suvorna hair cutting shears are silver color which is slightly polished, giving them a polished silver look. They also have gold plated elements such as knob for tension adjustment and finger rest for comfort. These barber scissors have stylish handle and Suvorna name on blades. As one might guess, these shears are intended for hair cutting. As they have many various features, they are suitable for professional hairdressers, but if you are student and you can afford it, they may be suitable for you as well. Considering that these shears have razor edge convex hollow ground blades which are known as very sharp and thin blades, you can use different hair cutting techniques, for example, slice, ship, point and blunt. These Suvorna Ador Hair Cutting Shears from Razeco e95 series are hand crafted with Japanese J2 420 stainless steel and they have razor edge convex hollow ground blades which are 2.5 inches long. Total length of these scissors is 6 inches. This product has features as adjustable tension, removable finger rest and detachable rubber finger inserts. These barber shears have polished silver look and gold plated elements – knob and finger rest. This product comes with synthetic leather pouch for safer movement. As these hair shears have many advanced features, they are suitable for professional use.